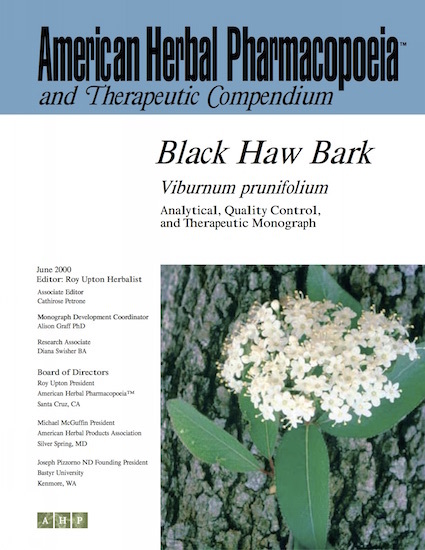 Black haw (Viburnum prunifolium) is a little-known herb used in Western herbal traditions as a uterine tonic and antispasmodic. It has been a primary botanical for preventing miscarriages, with a somewhat checkered history that is discussed in the AHP monograph. It is closely related to another uterine tonic, cramp bark (Viburnum opulus), with which it is often paired. While black haw is often used as a less expensive substitute for cramp bark, it is highly respected among traditional healers and medical herbalists. There are a number of techniques that can be used to distinguish between the two herbs, but it is fairly easy to visually distinguish one powder from the other as the two have distinctly different colors and aromas.